One of the most influential and awarded Country songwriters in the past 20 years, the songs of BOB DiPIERO have been major works in the careers of FAITH HILL, TIM McGRAW, GEORGE STRAIT, REBA McENTIRE, VINCE GILL, THE OAK RIDGE BOYS and many other artists. Bob's 30 Hit Singles include 13 #1's. Here is the writer of Take Me As I Am, Blue Clear Sky, Worlds Apart, Money In The Bank, Till You Love Me, There You Are, I Got My Baby and We're So Good Together. His acclaim includes 1998 Nashville Music Awards Songwriter Of The Year, 1997 Song Of The Year for Worlds Apart, 1995 & 1996 CMA Triple Play Award. 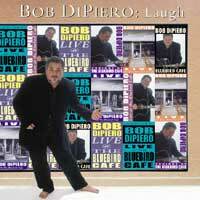 Recorded at The Bluebird Café, here is BOB DiPIERO singing his #1 Hits Blue Clear Sky, Daddy's Money, Worlds Apart, They're Playin' Our Song and The Church On Cumberland Road. Here is the humor, sensitivity, insight and imagination of a great songwriter with a little help from GARY BURR, RICHARD MARX, JIM PHOTOGLO, CRAIG WISEMAN, SHARON VAUGHN, AL ANDERSON, JEFFREY STEELE, SKIP EWING, KENT BLAZY, BOBBY BRADDOCK, WAYNE CARSON, JILL COLUCCI, JENNY YATES, VICTORIA SHAW, BILLY DEAN and JESS LEARY. Here's the magic and genius of BOB DiPIERO LIVE AT THE BLUEBIRD.